Berlin is a truly dynamic city, known for its significant history. Germany's lively capital, the city of Berlin has undergone enormous changes and reconstruction during the mid-20th century, whilst retaining a historic character. 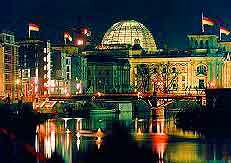 Again, following the reunification of Berlin in 1990, the city again made many sweeping changes and now offers a thriving cultural scene, plenty of top night spots and a number of lively entertainment venues.